Abstract: Objectives: Biomarker collection is common, however, specimens are typically collected in-person and such collection is generally thought to be less feasible for ehealth research. 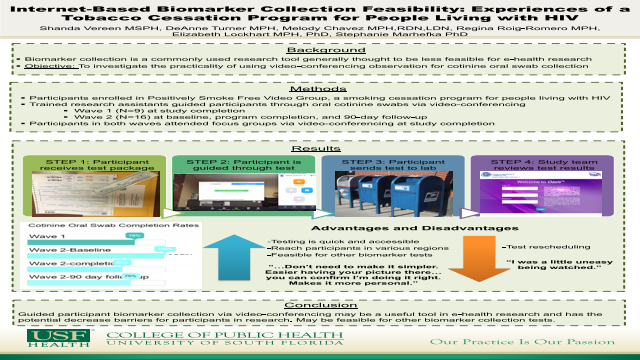 Guided biomarker collection using video-conferencing may make collection more accessible in ehealth interventions. We investigated the practicality of using oral swab biomarker collection via video-conferencing. Methods: Positively Smoke Free-Video Groups is a video-conferencing group-based smoking cessation program for people living with HIV. Two waves of an 8-session pilot were conducted. Special arrangements were made with the company processing the cotinine biomarkers to ensure tests could be received directly from participants. For legal purposes, the company typically only processes specimens sent by the observer, not the participant. Video-conferencing observation of biomarker collection is novel and was explained the company prior to specimen processing. In wave 1, trained research assistants (RAs) guided participants (N=9) through an oral cotinine swab via video-conferencing at study completion; for wave 2 (N=16), cotinine testing occurred at baseline, program completion, and 90-day follow-up. Participants were invited to participate in focus groups at both waves. Results: In wave 1, 78% of participants completed a cotinine test. In wave 2, all participants completed baseline cotinine tests; fewer participants completed tests at program completion (69%) and 90-day follow-up (75%). RA-guided cotinine tests were typically completed in ≤15 minutes. Just as with in-person tests, participants were observed from start to finish–ensuring the integrity of biomarker collection. During the focus group, all but one participant expressed positive attitudes toward completing cotinine tests over video-conferencing; this participant felt some discomfort regarding being watched on camera.